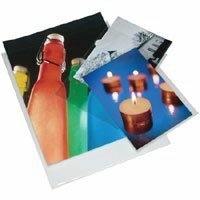 These clear archival polypropylene sleeves are sealed on three sides and hold two 20" x 24" prints or transparencies. 1/4" pocket tolerance. Opening on short side. Handles mounted prints. Ideal for presentation and safe storage of digital prints, artwork or documents. Pack of 100. Dimensions: 20-1/4 x 24-5/16. Other sizes also available.